After a hectic day day 1, we again got ready for another fully packed day on Saturday. 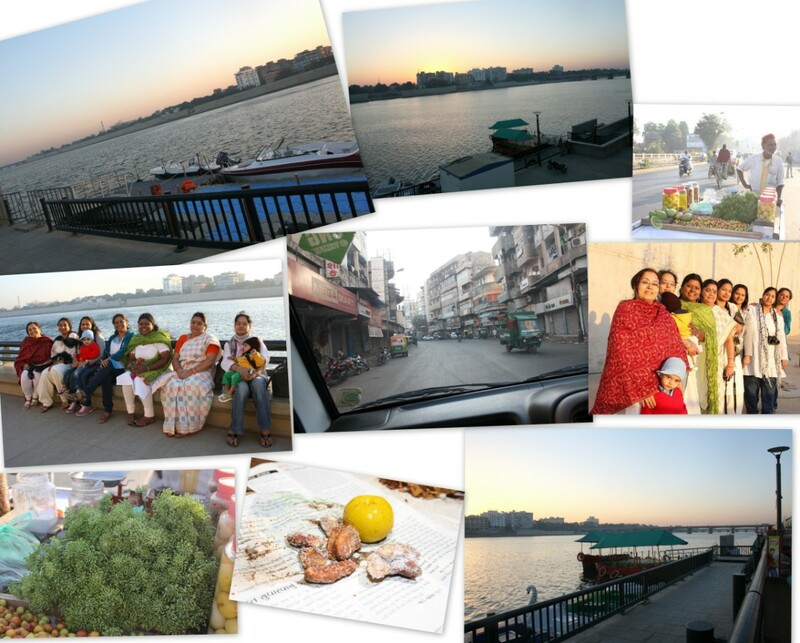 Though it was pretty late when I slept in, I was up early as I remembered Vaishali telling us that we had to visit the river side early morning. She was ready and came on dot, while everybody were running around. Coming back to the dress code we had for the day, well Vaishali was very particular that we all wear all white or with white tops with blue jeans for The photo shoot, which also had a surprise element attached. 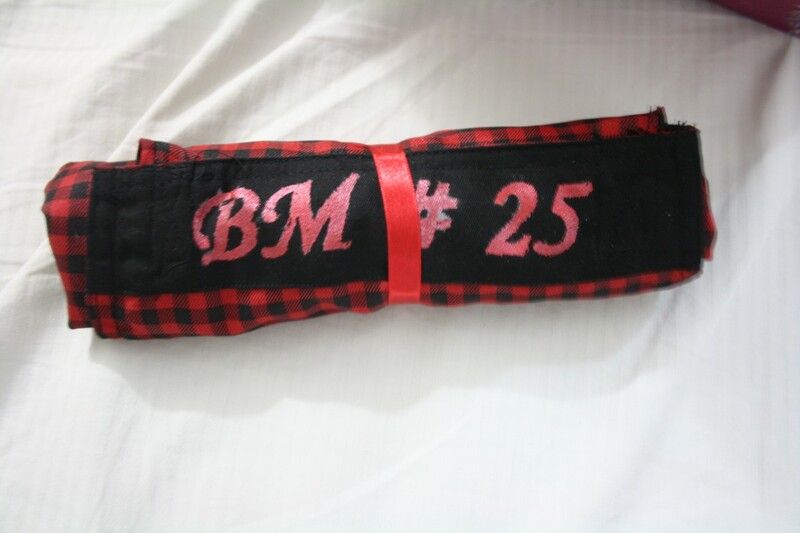 Yes she had made a special Apron with her own handwritten words that showed BM # 25. We were supposed to wear this apron through the day. 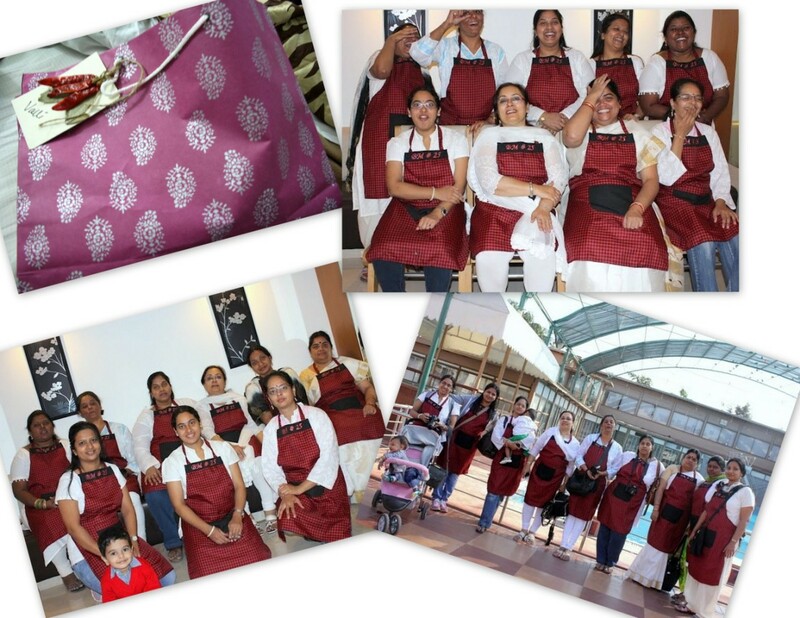 If you must know the fervour this created when a bunch of apron clad ladies walked around the city! It was utterly so cute and exciting. We all left for the river side at about 7.30 am or so. The roads as I said were beautiful, so wide and clean. And the bridges were breathtaking as well. The first view of the river can actually make you skip a beat. It was so serene and calm. Surprisingly even with company, you can still feel the peace the river was flowing with. We were told that the banks and the boating were a new add on. People have taken in for morning walks, for all the cheese and sweet the locals eat, they burn it out quite well. We had out fill out standing and clicking away pictures. For the onlookers, we might have looked extremely funny. Well it never bothered us much. Those were stolen moments that each of us had, will always have. Enjoying the girls company, the joy that comes when you are in a like minded group, the fun you end up sharing and the jokes that get cracked. Kamalika with her new found awareness of the camera was clicking away to glory! She found willing subjects who stood as she wanted, while she was running around all over the place to click us in different angles! We finally had to leave the place with heavy heart, as Vaishali was reminding us that we had a long day ahead. If not for Vaishali, whom we fondly now refer as Princi, none of the things would have happened, that happened. We might have ended up missing all the fun. She ensured we were running around as she had planned, and planned she did so much! Thinking back, one would actually wonder how one can pack so much in a day! She did and we did too! It was simply too much, yet each minute is etched forever in memory. I might as well write this post in many parts, however I know I might bore you all with minute details of our 16 hours of the day 2. On the way back, we were introduced to fresh Fennel Seeds. This was my first sight of a fresh Fennel. You get this off the streets. Can you believe when I tell that we were clicking like mad at whatever new food caught our fancy? Well we did and it was such fun. When you pop some fresh fennel and munch on them, you will be hit! Just close your eyes and it hits you with the freshness and the exhilaration of feeling akin to floating. Back from the river side, we were treated to a feast fit for the king and the queen of course. 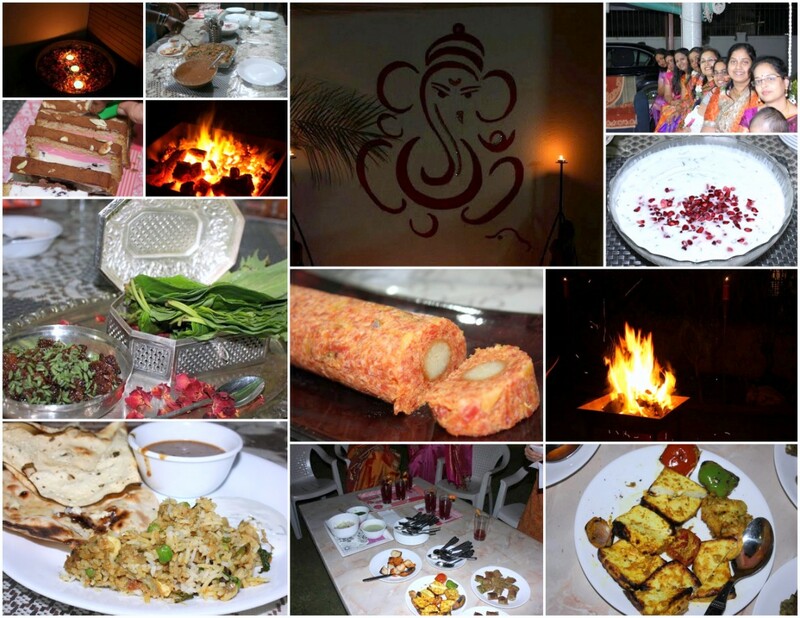 It was surely a gastronomical experience, par excellence and mere words are not enough to explain. 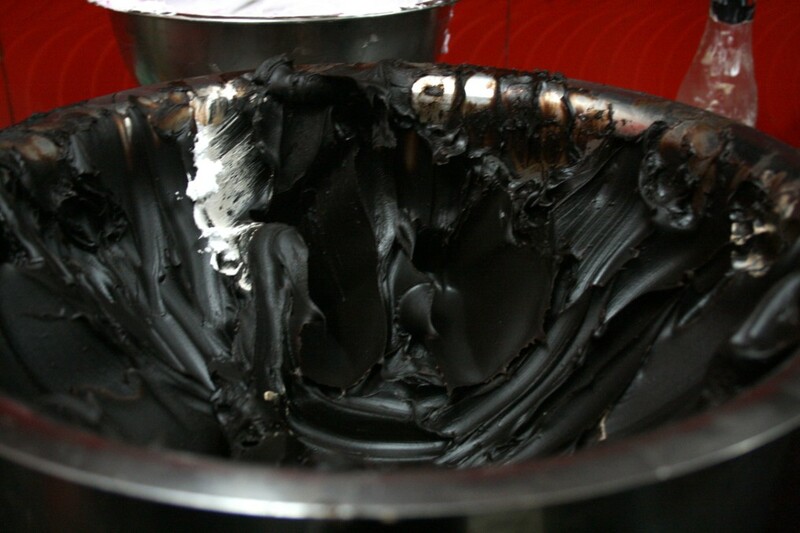 Vaishali warned us that it was only a sample, as the rest of the dishes were still on the way. Anyyway as if we were not tummy full, we saw the rest of the dishes being arranged. There were trays of Khaman, Khandvi, Sev khamani and Sandwich dhokla. I love Gujju food and this display had me going to heaven. We actually lost count of how many Jabelis disappeared or how many other dishes made their way! Sev Khamani was an interesting dish. It’s made with the crumbles of Khaman Dhokla and had a mix of pomegranate in them, to be topped with sev. Now isn’t that a wonderful combination? Then item that was planned was Chocolate Making. Vaishali had invited her friend, Ruchi, who is a professional Chocolate maker and does a great job at it. She made Dark Chocolate stuffed with Nutella, and trust me we were sad we got to taste only one! So if you are in Ahmedabad and want to some homemade, professional chocolates, you know whom to contact. I love rain, and I am sure most does, but can anyone not love Chocolate rain? Yes that’s exactly what happened when Ruchi filled in the moulds and she titled it without alerting any of us. For a moment you could actually hear our breaths! We wanted a repeated performance and she gladly obliged. 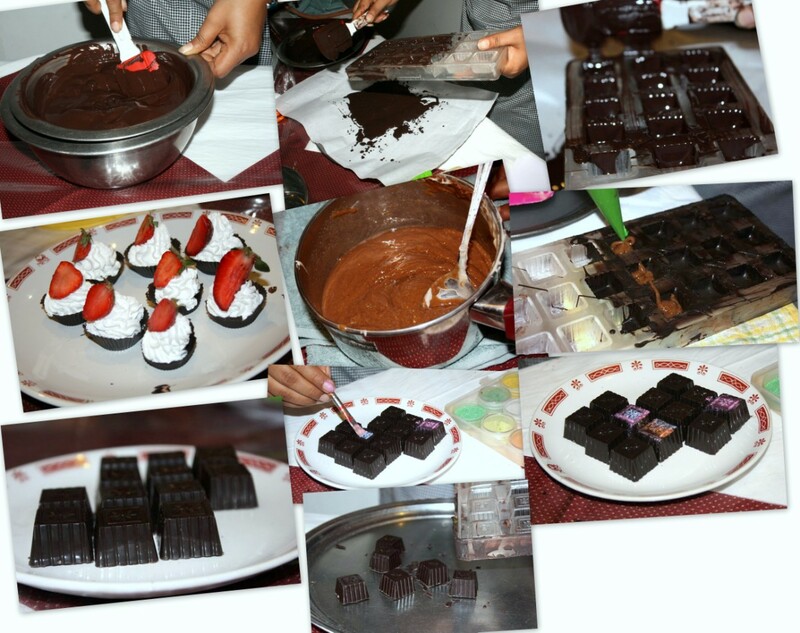 Finally the truffles set and the other moulds with icing and strawberry were done and disappeared within minutes. She had a huge bag full of the filling left out, which was so aptly used later in the night. Before going out for our next destination, we decided we should click group pictures, as most of us missed out clicking one for the first day! What followed the next 30 -40 mins were pure hilarious fun, with each of us trying our best to be on the best pose! Again the official photography was of course Kamalika. She even set it on timer and you can see one of the reaction when she gave the camera to Ruchi, requesting her to click, and forgetting to remove the timer. Ruchi was going on clicking while the timer was on. We were trying to tell her to remove and it resulted us being in comical poses! After the eventful photo shoot, we all rushed out to Cream n Crunch. Mr. Shimul Mehta, who owns the place was so sweet enough to share his busy workshop, and showed us so very interesting art works. 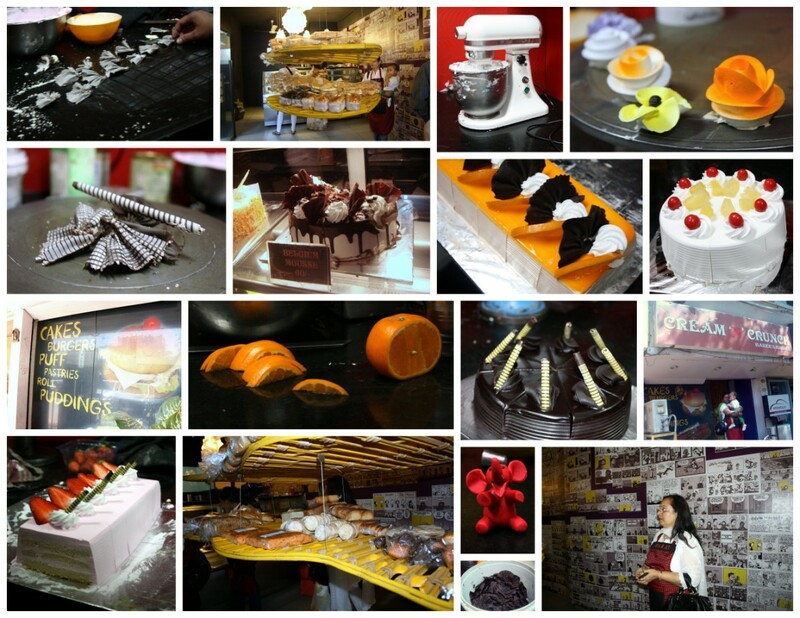 If you want to know what’s so special about this Cake shop, well it a shop where you get everything eggless! Imagine my excitement when I walked in and realised I could just like that eat anything I fancied and not worry if it was eggless! Gosh, it was too much and I was high on cake, believe me. The person who showed us how he does icing, frosting and of course make those Chocolate fans, Cigars, etc, was a expert. He was too fast and we had to request him to slow down for the pictures. Again the staff were so amused at our enthusiasm. What you see below is a huge vessel of utter sin! It’s full of Chocolate Ganache, can you believe? We didn’t know what to say, and when we tasted, my goodness we were in heaven. I haven’t tasted a professional Chocolate Truffle, and this was really out of the world. The bakers in Madras always claim eggless baking is not so easy when you bake in huge quantity. Though I only do eggless baking, I couldn’t counter attack, however after seeing this shop, I know better. I even requested Mr. Mehta to open an outlet, he said he will gladly set it up, if there are people to run it. So if any of you out there want an Eggless Cake shop, you know where to reach out. We ended up buying huge amount of Pizza chips, Multi grain breads and so many others. I badly wanted my family to taste the eggless wonders, however couldn’t carry them back. He packed us a Ferrero Rocher cake, which we enjoyed on the final day! We didn’t have the heart to leave, however Vaishali was reminding us all the while that we had a Lunch appointment for an authentic Gujju Thali at Sarbhara, Karnavati Club. She was also hinting me about a Barbecue night for dinner. She wanted to know if everybody would be fine with that. I said we would love kababs and what not if she was planning to give us an exclusive experience. For all she said about the dinner, she didn’t reveal the place. By the time we rushed in, it was pretty late and almost many of the tables were getting cleared. This is where the fun started. Almost all of them stopped doing whatever they were doing and just stared at us! Couple of them even came up to Kamalika and Archana, to ask if we were representing any News channel. Our tables were set and each item were serve one by one. They were hoping we would gobble up as soon as they serve, sorry guess they didn’t realise we were Food bloggers and wouldn’t even think of touching the food before clicking the food. Imagine Kamalika was already trying to do a whole thali, which reminded us of the Indian Thalis, we did last year, yet all of us waited to click from our own cameras. Result was a whole collection of Gujju food. Seeing each of the dish, I so badly wanted to remember, however I simply couldn’t get the right pronunciation, the couple of dishes I could remember, ‘cos I know them, were the Handvo, Undhiyu, Kadhi, a side dish with Channa, salad with apple and grapes, a pumpkin gravy, rotis and puris and finally Shrikhand. We simply couldn’t move ourselves! However for appearance sake we had too right, so we did. We came back and I hardly remember what we did between the lunch and dinner, as we were really full! After the heavy lunch, I didn’t have any energy left to move, however everybody were so keen on doing shopping. So Vaishali took us to a cloths shop. All were eager to shop sarees, I just wanted to pick for Amma and Athamma and wanted to rest. So I asked to be dropped early. On the way I came to know that Pradnya was taking Slok for toy shopping and I realised I had to buy something for the kids too. so I ended up buying Jigsaw puzzles and toys. Knowing how much they loved getting them, made the pain all good! We managed to rest our feet for a bit, but still jumped into reach room to chat with others. Pradnya who was still trying to arrive as a decision on the BM Chef Contest, confessed Vaishali’s son had given her his verdict. Kamalika and she were breaking their heads to see if they can include everybody. All of us were asked to contribute to the gift hamper that was prepared for the BM Chef. So since everybody’s dish came out so well, they were so confused. I didn’t want to do anything with the head breaking, my legs were breaking as such! It was soon time for dinner and we were supposed to deck up traditionally with all accessories. It was like a wedding, with everybody being so well decked up, with full fundo! Imagine the kiddos were decked up too. The best part of the three day trip, was interacting with the three babies, they made the trip even more beautiful! Vaishali was going on hurrying us up and saying the place might deny our table if we were ended up late. So all of us rushed out. I was sitting with Vaishali and she was telling me all about her daughter’s marriage and so many tales from her family, I realised we were going out of the city. When there was a talk about Vaishali’s garden, I mentioned to her that I would drop in her place to check out her patch. She promised me she would take us on Sunday. Then the conversation stirred back to so many things, that I was still wondering how this Barbecue joint will be so far off the city, when she took us to a lonely and long drive into a lane. Nothing hinted us to what was coming! We were lead into a long lane, fully decked up with lamps and decoration. I was shocked and asked her who would have decorated so beautifully for us. She gave a sly smile and said who would I think. It took me a full minute to realise we were at her home! The feeling that came in, can’t be explained in mere words. Her entire family had got in to arrange this special dinner for us. When I had met her son, he said he would meet us for dinner and I assumed he would be joining us. But I never assumed it would be at their home. They got the huge tandoor from the hotel and got the entire Barbecue at home. As she was with us the whole day, her husband and daughter made sure they got the entire arrangements done. All of us were simply blown away with their hospitality and kindness. They had made Tandoori Paneer, Aloo Cauliflower and with lentils. 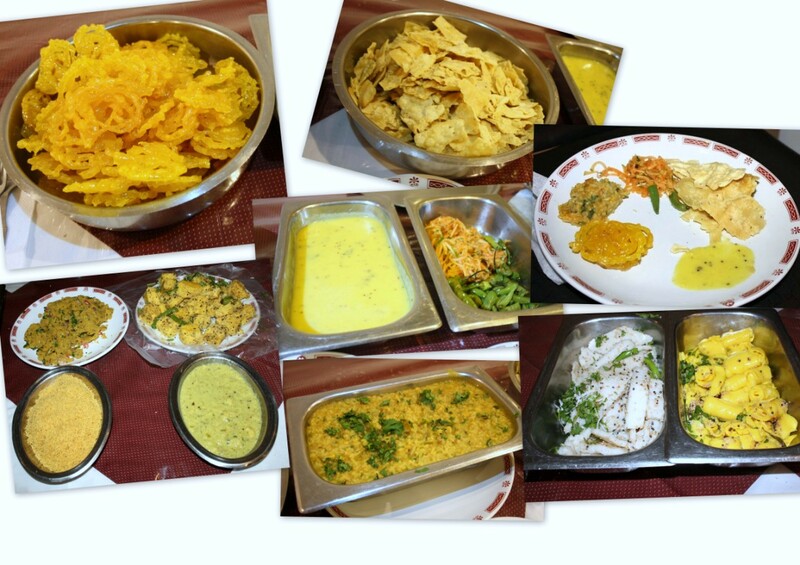 The dips were so delicious as well, as Vaishali’s daughter had made something new. I am hoping Vaishali will share all the recipes for the dips. By the time we finished with the starters we were not sure if we could go for the actual dinner. So to exercise we went around the house, and simply made a nuisance of ourselves to the rest of the family members. None seem to be bothered with us. They were so happy to meet us and entertain. In between all this, was another photo shoot, special being the gajras! Though it’s quite common in South Indian, I was told they don’t wear flowers on hair and that got in some excitement as well. The babies were happy to be left on the floor to roam around. Baby Choo’s favorite pass time was getting the shoes, so he almost did that when we got distracted with the shoot. Finally we went in for the dinner, though Vaishali said she decided only for just dal, biryani and rotis, it was still too much. She said she saved the best for later. And those were her famous Carrot Terrine with Gulab Jamun, Cassata Icecream. We were touched that she did all of it again for us. The final touch up was of course the Chocolate pan! When she wanted to do this post, she was discussing it with me, I said I was shocked that one could actually think of chocolate in pan. She not only did the post on Chocolate pan, but made sure I tasted it. Trust me, though I don’t like pan, I loved munching on this. She had used the Truffle filling that Ruchi made in the morning, with fresh fennel seeds. It I had gone to heaven and came back, would surely be true. We thought we had wrapped up the night, no she still had another demo for us. She had asked her help to show us how to make Rotla by hands. Imagine at 11.45 pm, walking out in that chill night to the next door to see how Rotla was being made. The lady and her family who showed us, were so happy and excited. Rajani had some of it packed and said it tasted great! We were too tired to even think properly, we somehow managed to drag our legs back to our rooms. I was only wondering, if all we did was simply watch and enjoy, how much pain and trouble others took for us and felt too good! I bet it was a once in a life time experience!! OMG so much of food and fun!! unbelievable!! 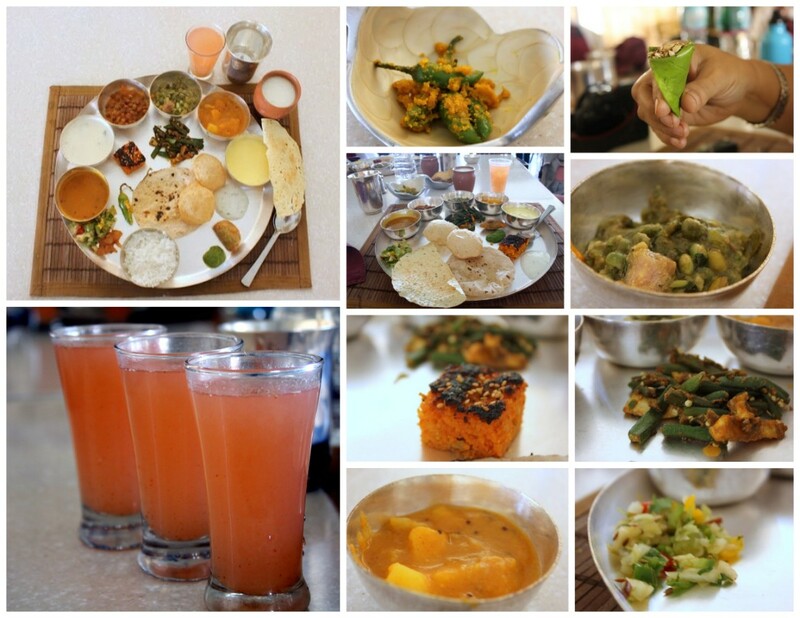 I truly loved those thali and pastry pics. What a detailed write up Valli. Just enjoyed going thru it. The chocolate paan and the fresh fennel in it were really killer items, right? Oh how i wish it was 8th Feb today! Wow Valli….such a nice and lovely post. Feeling jealous reading all the fun u all had. Hope to meet u all some day. This is definitely a life time experience,every blogger should live this na, Vaishali my hats off to her,she deserves a lot for organising everything. Gals am jealous you know.Wat a busy and long day, Srivalli, how beautifully you have written this post, wish i do write as you, well done. Lovely post and a visual treat..